Urticaria is a skin disorder in which episodic or transient (coming and going), hives or wheals develop causing intense itching, redness and swelling on the skin surface. Urticaria may be accompanied by angioedema, which is swelling and pain of the lips, tongue, airways or genital area commonly, although may occur in other areas as well.Urticaria is a mediated by the release of a chemical called histamine, which gets released from the mast cells present in our body. There can be various triggers which result in the degranulation of vesicles in the mast cell and release of the chemical called histamine resulting in the signs of inflammation. Urticaria may be Acute which is typically a result of infections, food mediated etc. or chronic which occurs almost everyday for more than 6 weeks. Further, another variant of urticaria is “physical” urticaria which is result of pressure, sunlight, sweating etc. Urticaria has a severe impact on the quality of life as the patient might get frustrated with recurrent itching at odd times, which is embarrassing and disturbing. 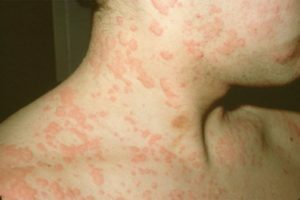 Insect sting or bites can incur the starting of urticaria infections. Intake of some foods like shellfish, peanuts and eggs can also become one of the reasons for urticaria. Physical factors like excessive heat, sun exposure and cold temperature may also be one of the causes of urticaria. Some medications can also prove to be responsible for the occurrence of urticaria. 5.Blood transfusion is also found to be the causing agent of urticaria. Some plants such as poisonous oak and poisonous ivy when comes in contact with skin may spur the onset of urticaria. Proper and complete treatment of urticaria needs a detailed diagnosis of the medical history and present medical conditions of the patient. Generally, oral histamines are the mainstay of treatment. At Dr. Kandhari’s Skin Clinic, every possible step is taken to keep the diagnosis individual, personalized and targeted. So, if you are searching for an effective urticaria treatment in Delhi, please feel free to contact us.